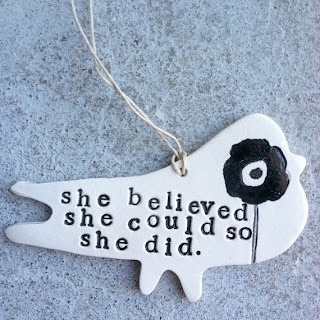 Mama Needs to Run: I believed I could, and so I did...20 miles! I believed I could, and so I did...20 miles! I read blogs in Google Reader to fall alseep almost every night. I used to suffer from a lot of insomnia, but something about reading stuff on my iPhone in bed in the dark makes me sleepy. Last night I read the New Years Day post on Another Mother Runner. Which opened with this photo. There couldn't have been better words to inspire me for the 20 miles on the schedule for the morning. The content of the post was good, but it was these words that really stuck with me. I've pretty much been off my training schedule for almost a month. I injured my back on December 8th and ran just 20 miles from then until the end of the month. I missed some long runs, and some middle of the week runs. Holiday events, multiple church services, family in town to hang out with and so much else just made it hard. I realized one reason it's difficult to train through December. But I don't even know if I would have run 20 miles if I wasn't training, so I suppose that was a good thing. I ran 18 awful miles early in December. Technically, I could have called that my longest run and moved on. But I really wanted a 20-mile training run. Plus I needed to redeem that awful 18 miler. Bean and I determined that today was the best day for my long run. The last day of our vacation. It was hard for me not to log miles on January 1st--the first day of the year, but I figured that 20 miles on the 2nd would make up for not running on the first day of 2012. So this morning I woke a little after 6am, while the rest of my family enjoyed sleeping in on the last day of vacation. I ate peanut butter & banana toast and drank my coffee and headed out shortly after 7am. I decided to run from home, even though my route would include some hills that challenged me during my 16-miler. I changed up my route a bit, so I didn't have AS many hills and I benefited from the downhills of the hills I ran up. Since I hadn't done a long run for 3 weeks, and not much running at all, I decided to do 5 minute run/1 minute walk intervals. I thought it would give my body a bit of a break and hopefully help me not crash like I did with 18 miles. I think the strategy was a good one and I'm toying with running some of the marathon that way. I could attempt a mile-by-mile review, but that would be too long and probably boring. My back didn't bother me at all, yay! I finished! I finished 20 miles. Last time I could barely run down the hill that is 2 miles from home. This time I totally did. In fact I realized I was running too fast because one knee was starting to hurt and the other quad started seizing, so I had to slow it up! Nuun. I love it. I was dreaming of Nuun and an ice bath at the end. It got HOT about 9:30. And I was running the lake at that time, which gets an extra beating of the sun. The heat really played a factor in my last hour. We are having unseasonably warm weather. I hope it breaks in the next 20 days. After I finished 20 miles and started walking, I turned my belt around to access my phone easily. Which put the attached water bottles around the back, and I finished the .75 miles that way. It wasn't bothering me while walking, but apparently the bottles put pressure on my back while walking, bruising it. Seriously, I get the award for stupid injuries! I finished my run just under 4 hours. I was out there longer, paused my watch at lights and a few short breaks, water refills etc. I had wanted to have an average pace around 11:00, but it was 11:30. BUT, I'm not bummed. I'm still happy with it. My lack of running for 3 weeks, plus the hills, plus maybe a few holiday pounds, all play into it--and I'm just proud I finished and I didn't feel completely wrecked. That was the goal. My watch didn't pick up my mile splits, which I'm bummed about, I think I turned them off when I set the intervals. I need to experiment and make sure they work together before the race. I'm going to do this. I'm going to run 26.2 miles. I am SO getting that sticker for my car. I believe I can, so I will. what happened with my stomach?? Here we, here we go! Let the carb loading begin! to carry water or not?